Ozzy Osbourne was once public enemy number one. But times change and since his reality show ”The Osbournes” he has become a big national celebrity that everybody loves and has even had dinner with America’s old president at the White House. Nowadays, Ozzy can’t do no wrong and even though he has admitted being under the influence of both drugs and alcohol during the recordings of The Osbournes, he couldn’t create a scandal no matter how he might have tried. Today, Ozzy Osbourne is a celebrity and no one cares that he was one named The Prince Of Darkness. Hell, even my mom and her husband, both in their seventies, loves The Osbournes. Tragic, for us who still sees Ozzy as some kind of a rock ‘n’ roll rebel. But one thing that hasn’t changed and that is that the ole Oz still keeps on writing new music and releasing new records and he also keeps on touring and he does make for a really great 90 minutes of metal. But the quality of his records has been somewhat up and down lately. In fact, the last really strong CD was Ozzmosis, released in 1995. Its follow up Down To Earth (2001) was just a couple of songs away from a complete disaster and after that only a couple of compilations and a pointless cover album, Under Cover (2005) has seen the light of day until his first album of original songs in six years, Black Rain (2007) came out – a heavily debated album among Ozzy’s fans. I still regard that album as pretty good. It’s far away from his classics, but nevertheless, a good album with a heavy production from Kevin Churko. But the quality problem remains here even though he has shaped up bit on this album. Opener ”Let It Die” is heavy tune that is pretty good where Ozzy talks more than sings, ”Let Me Hear You Scream” is groovy rocker that sounds like a Rob Zombie tune with Ozzy’s vocals and ”Life Won’t Wait” is a very good half ballad. ”I Want It More” is heavy with a Zeppelin-ish groove that has a chorus that sounds like the classic Ozzy we all love. More of that, please. Then there’s songs like ”Soul Sucker”, a heavy track with Alice In Chains-like guitars that goes absolutely nowhere and then there’s ”Crucify”. 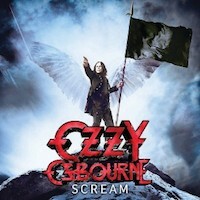 Didn’t Ozzy recently sang on a track off Slash’s new CD called ”Crucify The Dead” that sounds similar to this? Where’s the imagination? And that is the problem with Ozzy’s albums of late. He tries too hard to be modern when all he should be doing is the melodic metal he’s so good at. Remember Blizzard Of Ozz? Diary Of A Madman? Or even No More Tears? After watching episodes of The Osbournes, I kinda get the feeling that Ozzy doesn’t have that much input where to go musically and that he more or less does what he’s told. ”I Love You All” is a short ”thank you” song to all his fans, a nice gesture, but totally pointless musically. New guitar player Gus G does a good job here, but he is certainly no Zakk Wylde. Or Jake E Lee. Or Randy Rhoads. But then again, who is? This is a good album for sure, but it doesn’t sound like a Ozzy album to me. Kevin Churko might be a really good producer, but the fact is, he has been dragging Ozzy in the wrong direction sound wise on his two latest albums. Ozzy doesn’t need a modern sound, Ozzy needs to sound like Ozzy. My guess is if he looked back on his older albums, got himself a new producer and a new songwriting partner that understands how Ozzy SHOULD sound, we might get one of those killer Ozzy Osbourne albums once again.